The idea of an Orthodox Christian alliance in geopolitics became fashionable in the 1990s, when the late Professor Sam Huntington propounded his "Clash of Civilisations" theory. He argued that one pole in world affairs would be an eastern-Christian bloc, linking Russia, Serbia and Greece. War was raging in former Yugoslavia at the time, and pro-Serbian sentiment was abundant in Greece, both among Orthodox bishops and anti-American Marxists. That made the theory more plausible. But the fashion for Orthodox geopolitics died down when the Balkans as a whole were drawn closer to the Western orbit and Greece enjoyed a burst of euro-fueled prosperity. Now of course that process has gone into reverse. As a theory of modern history, it's easy to pick holes in Huntington's idea. Greece has indeed fought wars in alliance with Orthodox Serbia, but also quite a few against Orthodox Bulgaria. Tsarist Russia was sometimes in alliance with the Greeks, who gratefully recalled a prophecy that "a blond race of the same religion" would liberate them, but there were also periods of bitter rivalry. For the first few years of the 20th century, the Greek elite saw friendship with the Ottoman empire (which they hoped to Hellenise from within) as the best antidote to Slavic expansion. 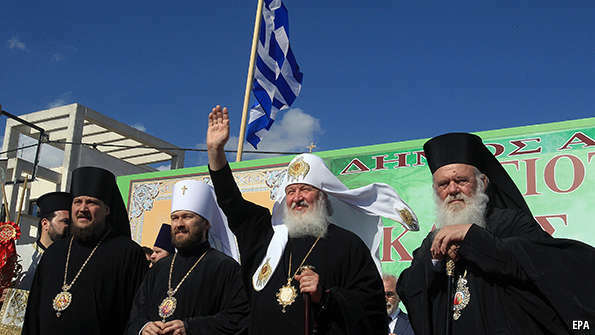 In the early 1950s, two historically important authorities in the Orthodox world, the Patriarchates of Constantinople and Moscow, were on opposite sides of the cold war. In more recent times, Orthodox Russians have clashed with no less Orthodox Georgians, Ukrainians and Moldovans. And Orthodox Georgia gets on better diplomatically with Muslim Azerbaijan than with eastern-Christian Armenia; Armenia gets on fairly well with Iran. So there is no basis for religious determinism in diplomatic history. This much can be said; when the diplomatic stars are aligned, common cultural and spiritual reference points can give added resonance to a relationship. But such links are not necessarily exclusive. The religious-nationalist thinking personified by the Russian philosopher Alexander Dugin, a friend of the new Greek foreign minister, can in certain moods stress Orthodox Christian solidarity and in other moods seek friends in the world of Islam. The only fixed point, for Mr Dugin, is opposition to the West and liberal democracy.